Dubai, UAE, November 29, 2018: Global sports brand PUMA has teamed up with Hot Wheels to celebrate 50 glorious years of design and performance. 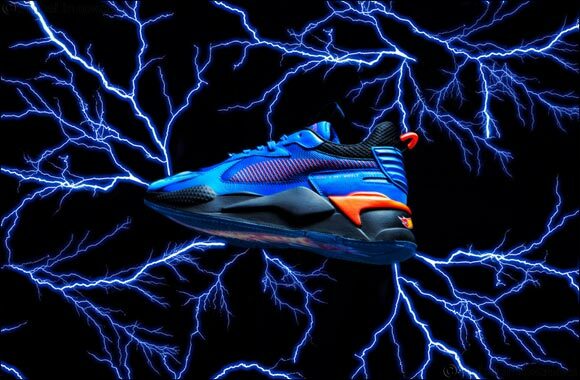 Paying homage to five decades of epic stunts and races, the exclusive PUMA x HOT WHEELS collection is set to take fans off the tracks and onto the street in style. With legendary toy cars reimagined in the all-new RS-X silhouette, the collection features three exciting iterations in the RS-X Toys range. RS-X TOYS HOT WHEELS 16 dates back to the “Original Sweet 16” – the first collection of Hot Wheels die-cast toy cars which were touted as the most influential cars of their time. Dropping in PUMA Royal – PUMA Black, the sneakers feature clear transparent rubber outsole with the Hot Wheels graphics on the reverse side. Paying tribute to the toy car that was created 50 years ago, the RS-X TOYS HOT WHEELS CAMARO takes cues from the ’68 Camaro custom edition. An ode to the life-size replica built in 2018, these sneakers drop in Vibrant Orange – PUMA Black colorway. The RS-X TOYS HOT WHEELS BONE SHAKER reinterprets the famous casting launched in 2006. A nod to the anniversary Black & Gold Rodger Dodger die-cast car, these kicks are decked in PUMA Black while the Formstripe and quarter features PUMA Gold and laces are intertwined with gold threads. Drawing inspiration from the 80’s classic Running System (RS) line, PUMA has created the all-new RS-X extreme reinvention silhouette, based on - extreme reinvention - inspired by sport but made for the street. With its bulky design, bold color palette and material mixes, RS-X Toys celebrates collectibles in and beyond the sneaker culture. Completing the pack with a wide range of apparel, the collection includes PUMA x HOT WHEELS T7 Track Pants and Jacket with customized T7 insert that ties back to the iconic Hot Wheels cars and tees with PUMA x Hot Wheels graphic and woven label. The PUMA x HOT WHEELS collection for Men and Kids drops globally on PUMA.com, PUMA retail stores and select retailers worldwide on December 1, 2018.